I've just spent a week in Murcia, Spain where wines made from the Monastrell grape are produced in a bold fruit forward style. Murcia is in the southeastern part of the country and although it's not far from the sea, it is hot and dry during growing season. The terrain reminded me of Arizona - specifically the Verde Valley area near Sedona where the desert gives way to scrub vegetation accompanied by a sprinkling of trees. The Murcia region is by no means lush. However, the rocky vineyards with limestone and clay soils stress the vines into producing grapes which can result in outstanding wines with intense color and flavor. Along with 7 fellow US bloggers (find them on Twitter here) on a trip sponsored by the commerce department of the local government, I visited the Denomination of Origins of Yecla (yeck-luh), Jumilla (who-meal-uh), and Bullas (boo-ya!s), visited ten producers and tasted through dozens of wines to get a feel for what this area has to offer. What I found was a region continuing to emerge as a value driven producer of fine wines. I came into the trip looking to gain broader exposure to the styles of wines being made and discover new producers. Prior to the trip I enjoyed what I'd tasted in the $6-$12/bottle range and I wanted to get a sense for what their more expensive wines were like. What does a $25 Monastrell taste like? A $40 one? Murcia has not-so-long-ago completed a transition from being primarily a bulk producer of wine (sold to other regions to embolden wines) to producing bottled fine wines. 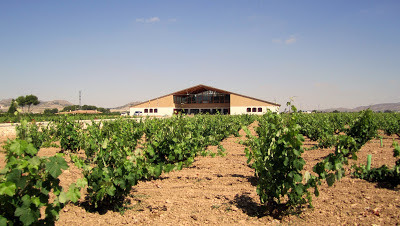 The market is still there for bulk wine, but most bodegas (Spanish for wineries) now use dedicated parts of their facilities for bottled production. The challenge for most producers, now that they've established themselves as a great source for a delicious, bold and juicy $10 red, is to take their wines to the next level. We visited benchmark producers in the region like Juan Gil, Luzon, Barahonda, and Castano. Others that have a more classic feel like Casa de la Ermita, Olivares, and Bleda. A couple cooperatives: Bodegas del Rosario and La Purisima. And a couple blazing a trail in a more modern direction: Carchelo and Hacienda del Carche. The area is infused with talented winemakers who've trained in other regions like Bordeaux, Burgundy, and Napa. Most are locals who've returned to combine international winemaking experience with local knowledge of how well the Monastrell grape performs in the region. 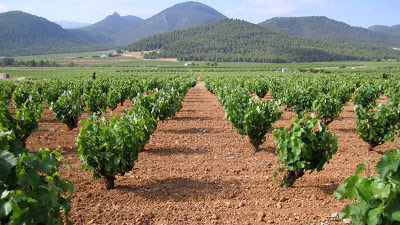 Although it regularly hits 110F in the vineyards in the summer, and the region gets about as much rain as Los Angeles in a year (not much) most Monastrell thrives in Murcia without irrigation. Older Monastrell production techniques often left the wines tasting overly rustic with dour personalities. Newer sensibilities, when successful, produce fresh wines from this warm climate. New world style from an old world country. Respectful of their past while moving towards the future. For $6-$12 you can get an amazingly good bottle of red wine from Jumilla, Yecla, or Bullas. The reds have an appealing lusciousness and freshness to them even though they're quite full bodied with alcohol levels regularly north of 14.5%. Especially considering that their core flavor profile is similar to the popular but often spendy Californian wines we enjoy in the US, this is a region savvy US consumers are buying from. Reserve level wines, differentiated by the amount of time they spend in oak and in the bottle prior to release, were less consistent. I felt some were poorly integrated with surprisingly rough edges and overwhelming tannins. In some cases, the effects of a substantial oak regiment was overbearing and the core flavor profile took off in an unappealing raisiny direction especially when made with grapes from old vines. In many cases, going from $8 to $18 takes the wine in an undesirable direction for what I'm looking for. However, a few wineries absolutely succeeded in taking it to the next level. Higher end wines from Juan Gil, El Nido, Barahonda, and Castaño were especially outstanding. The area's biggest weakness is perhaps their biggest strength for value hunting consumers: For the most part they're not particularly good at marketing. And this has resulted in prices which are low even when compared to similar quality wines from value regions like Chile, Argentina, and Australia. It's tough for a region like Murcia to stand out in a crowded wine market. For as long as wine publications have beaten the drum about Spain as a value region, Murcia is just one boat in the sea of value producing countries. Even within Spain they compete for attention with the likes of Rioja, Ribera del Duoro, Priorat, and Toro. With US retailers devoting just 10% or 20% of their shelves to Spain, wines from Jumilla, Yecla, and Bullas can be somewhat hard to find. But beyond marketing the region as a whole, I find the way their wines are marketed confusing. As an American consumer, brands are extremely important to me. Once I discover something I like, I want to explore other products in a brand's portfolio and see whether offerings at other price points deliver similar value. BMW does a great job with this: Their entry level products provide a representative window into the brand then they walk consumers up through their offerings over time. With many (but not all) of the bodegas in Murcia it was hard to make these connections. I visited wineries I'd never heard of only to discover I'd tried their wines before under a different label. This is a big problem if they're looking at taking customers from $8 to $15, from $15 to $25 and from $25 to $40. Winemakers and export managers I spoke with differed in their opinion about these marketing challenges, but most of them alluded to the importers driving the branding direction. And who can argue with results? Some of these labels (many of which are produced exclusively for retailers like Total Wine, Costco, and Whole Foods) have been very successful in the US. Visiting the region helped my understanding tremendously and I'm looking very forward to exploring the category further once I'm home. But I've got to think I'm not alone in being confused when navigating this space. Exploring the wine world is about making connections between wines you like and others like it for one reason or another: Similar style, same region, same vineyard, same winemaker, same producer, etc. Everyone's journey is different and that's what makes it special. I'm looking forward to sharing stories about the connections I made on the trip. Almost all of the producers we visited have distribution in the US so I'll share some immediately actionable value plays. I'll try to pinpoint where I think peak value occurs. I'll go deeper into who I thought were the top producers in the region (one of which my infatuation took on comically epic proportions). I'll write about a couple of producers I have a feeling will help shape the future direction of the region. And they've got some great rosés - I'll mention a few of those as well. I'd love it if you joined 800+ others and subscribed to The Wellesley Wine Press to receive notifications of future updates! 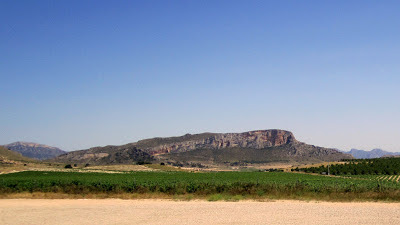 "You might think that these stony-limestone vineyards between Alicante and Jumilla should do rather well in terms of quality, but although some decent wines can be found, nothing special stands out." "This is a large region just south of Jumilla where the soil is so poor that, aside from vines, only olives and almonds can survive." But things are changing here quickly. "Monastrell is the greatest underappreciated red in the world today from a growing area (Alicante) that is barely known in Spain, let alone here in the US." To be successful finding value wines with a similar flavor profile to the wines of Napa you've got to become familiar with lesser known regions and varieties like this one. Despite my increasing interest, Spanish wines still comprise a very small portion of my wine spend. I asked friends on Twitter what percentage of their wine collection/consumption were from Spain and it sounds like I'm not alone. Most everyone I asked had less than 2% of their collection from Spain and the number was only slightly higher in terms of consumption. Spain is a country of great regional diversity and it's as hard as any to put in a box. I mean think about it: It's an old world wine country but I would argue it's tremendously friendly to new world wine enthusiasts. And how many Spanish wine producers can I think of that I'd specifically seek out? Hardly any especially compared to domestic brands. Brands are tremendously important in the American market and one thing I'll be looking at closely this week is how producers market their brands. Coming from a more domestic wine driven background I'm comfortable picking up a bottle and seeing winery, vareity, vineyard/appellation and vintage. I was holding a bottle of Spanish Monastrell a few weeks ago and it wasn't clear to me at all where the wine was from vs. what was a family name vs. what was a brand name. Clearing this kind of haze and knowing what to ignore when looking at a label is a key hurdle in building affinity for a region. It's like looking at street signs in a foreign country - you need to know how to ignore the multiple names for a street and focus on the important part of the name. I once saw a tasting note where the reviewer said "I don't like the Bodegas wines" as if Bodegas was a producer. Bodegas means winery in Spanish -- the reviewer was clearly confused and didn't have familiarity with Spanish wine labels. It's this kind of confusion that visiting a place in person quickly clears up. I watched a bunch of episodes of Spain on the Road Again to familiarize myself with the region before coming. Remember that show? It aired on PBS a while back and it was the one where Mario Batali and Gwenyth Paltrow drive around Spain eating and drinking. As far as finding content that's aligned with an upcoming trip it was an excellent match, but it was really quite boring at times. I hope to provide some immediately actionable recommendations of wines of tremendous value from visits on this trip. Here are 3 Sub-$10 Spanish Monastrell (that offer silly value) to get you started. Question of the Day: What percentage of your wine consumption is from Spain? What's stopping that number from being higher? 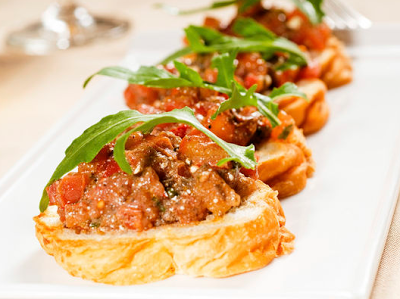 LivingSocial is offering $20 for $40 towards Chef Michael Schlow's Alta Strada in Wellesley, MA. Firmly the second best finer dining establishment in town (behind Ming Tsai's Blue Ginger) Alta Strada positions itself as offering upscale yet approachable Italian cuisine.. The voucher expires September 24th, 2013 so you'll need to use it this summer (when most everyone is summering in their Cape houses) or after back to school/parents night festivities shortly after schools reopen. The offer can't be used towards alcohol but since restaurants in Wellesley require you to buy food when you're buying a drink you can use it towards the food items you enjoy along with wine. They've got a very good Italian wine by the glass program. And if you get in a jam and can't use it before the expiration date you could always grab some take-out from their market downstairs. Angelina Jolie and Brad Pitt have somehow found time to secure a summer home/vineyard estate and bring a wine brand to market. That in itself isn't worth a mention, however what's worth mentioning is this: The wine is fantastic. The brand is Miraval - and by all accounts the celebrity couple's participation in the project is more than a rubber stamp branding affair. According to Wine Spectator the couple participated in determining the blend of the wine as well as the bottle/label design. They've partnered with the Perrin family which is responsible for, among other things, the well-regarded Beaucastel Chateauneuf-du-Pape. The final results are impressive. 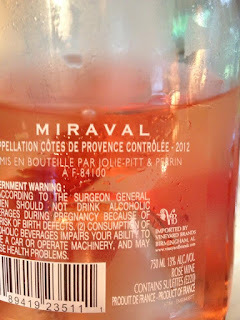 The only mention of Jolie-Pitt is a subtle "mis en bouteille par Jolie-Pitt & Perrin" on the back label of the uniquely shaped bottle. It's just enough to confirm to those seeking the wine they've found what they were looking for. 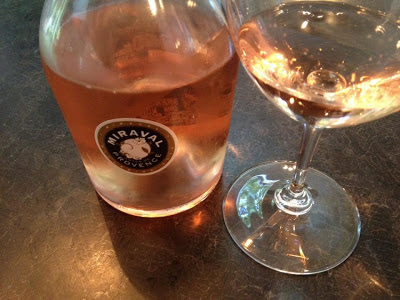 This rosé is the first wine to be released. According to the winery website a white and red are slated to follow. If they're anything like the rosé I'll look forward to tasting them. My goodness - this is an outstanding wine. It's so well balanced. I have a hard time finding a flaw with it. There wasn't an off note in the bottle. The color is a gorgeous watermelon candy pink with a hint of copper. An inviting fruit forward/floral nose conveys to the palate with medium/full weight almost like a light/medium Oregon Pinot Gris. It's never overly heavy yet is tremendously satisfying to drink. Full of flavor but doesn't get out of whack. No distracting herbal notes - just pure enjoyable fruit balanced with medium-low acidity. 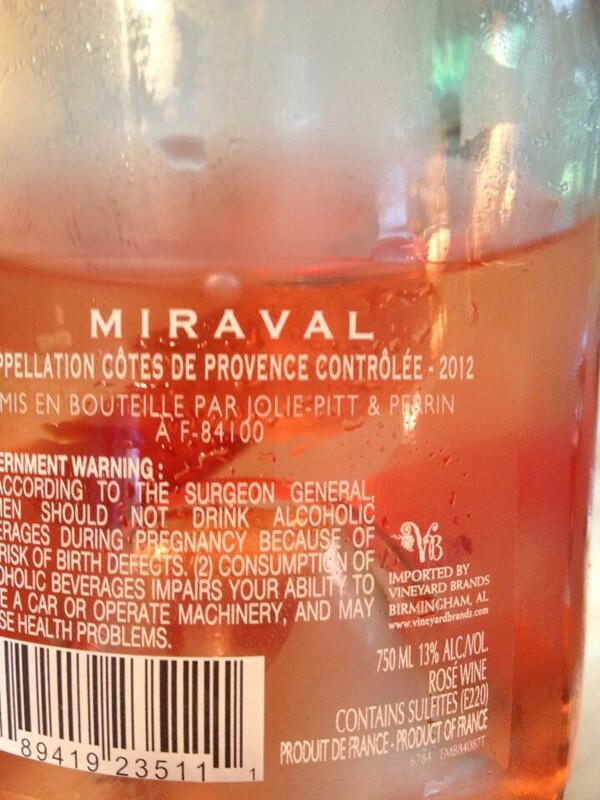 Overall it strikes me as a very well made Provençal rosé targeted for the American market. There was some talk when this wine was released in Europe of it being quickly sold out. However, there does seem to be good availability in the US. Retailers and consumers: If you've seen this around at a good price (I'd say $17.99 to $19.99 is a good price) let us know in the comments! 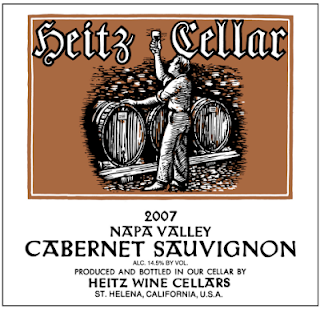 One of my first trips to Napa back in the day included a stop at Heitz Cellars. The tasting room was humble and the location was almost too obvious - right off Highway 29 immediately after V. Sattui. The winery has been around forever and although I enjoyed their wines I couldn't help but think the brand had passed its prime. I don't know what it was specifically but I left with the impression the winery's best days were behind it. As years went by I'd read stories about how great Heitz Cabernets from the late '60s and early '70s were - especially their Marthas Vineyard bottlings. But what was I going to do with that information? It's not like you can track those wines down and even if you could they're a bit anachronistic. By that I mean - California wines made in the '60s bear little resemblance to wines made today. Alcohol levels have risen dramatically and the wines of California have discovered their own direction rather than trying to emulate other great wine regions like Bordeaux. So even if I found I liked older Heitz Cabs it would have little to do with what they're making today. These days Heitz makes Cabernet ranging from ~$40 to $200. The Martha's Vineyard is their top wine and a Napa Valley appellation bottling is the entry level offering. Trailside and Bella Oaks fill in the middle in the $60-$70 range. The Wine Cellar of Stoneham had a tasting late last year with a bottle of the 2007 Heitz Napa Cab open alongside some tremendous wines. A $600+ bottle of Penfolds Grange plus Napa Cabs in the more conceivably actionable price range of $60- $100 provided an opportunity to discover value wines that could fight in a weight class higher than their price point. The 2007 Heitz Napa held its own and then some. This wine skillfully finds the intersection of deliciousness and quality. The 2007 is still available on retailers shelves so here in 2013 it's arriving with 6 years of post-vintage age. And that age has softened any rough edges that may have been present on release. Plush dark fruit on the nose, cola on the palate, and soft tannins make this very appealing. So enjoyable to drink. Low to medium acidity enables this to go well on its own or with food. Everything is in balance here. The wine strikes me as a classic pair of Levi's. Quality that never goes out of style, but not pushing it so hard in any one direction that it'll look stylistically ridiculous a few years down the road. Definitely worth a try for around $39.99 if you spot it at retail. I'd love it if you subscribed to The Wellesley Wine Press to receive email notification of future posts. After a couple of challenging California vintages in 2010 and 2011, I'm looking forward to the 2012s coming to market. In the grand scheme of things, quibbling about vintage variation in California is a bit ridiculous. The weather there rarely presents the challenges seen in other regions. But when you hear and read stories from winemakers about record heat spikes after cool growing seasons - where leaves were pruned to increase sun exposure then resulted in over exposure - you tend to think only the best producers will put out quality wines. And indeed that's been the case in my experience. Reliable producers put out outstanding wines in 2010 and 2011. But the average quality of wines hasn't been as good as it was in better vintages like 2007 and 2009. And that's fine by me. As consumers we need a chance to take a breather to drink wines from from our collections rather than growing our stashes. When I was on the fence about purchasing pricey 2010s and 2011s it was anticipation of better wines in 2012 that talked me off the ledge of making large purchases from producers I wasn't personally familiar with. So far, the majority of 2012s available in the market are rosés and some white wines. My experience has been mixed, but admittedly I'm more of a red wine guy. 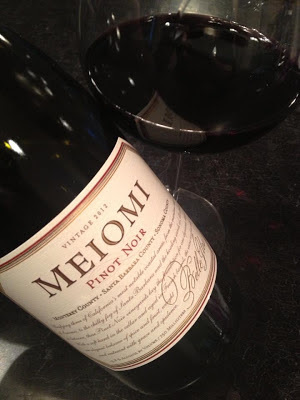 So I was looking forward to trying a bellweather California Pinot Noir in the form of Belle Glos Meiomi. It's amazing how quickly they release these wines. A 2012 Pinot Noir in June? They're released along with rosés! Anyway, I thought it was amazingly well formed for being so young and in line with the house style. Which is to say - luscious and fruit forward, a crowd pleaser that's hard not to enjoy. I've seen more variation from bottle to bottle of the same vintage than from vintage to vintage. This stuff is like Budweiser for better or worse - always about the same no matter where or when you pop it. For the most part it's tremendously appealing - even if it isn't the most terroir driven Pinot Noir in the world. I like it and I always want to have some on hand. What are your thoughts on recent vintages in California? Have you been buying less or only from trusted producers? Are you looking to buy a lot of the 2012s? Michael Honig of Honig Vineyard & Winery is coming to Blanchards in West Roxbury, MA for a moderated sit-down tasting seminar. Honig is best known for their Cabernet Sauvignon ($40 retail) and Sauvignon Blanc ($16 retail) that tend to deliver enjoyment on par with wines costing much more. They also make single vineyard Cabernets along with smaller production bottlings which are available at the winery. I love the way their Cabernet strikes a balance between luscious fruit and supporting savory notes. The event is Wednesday June 12th from 7-8:30 pm in the Blanchards Vintage Room (upstairs from their retail store in West Roxbury).